Our hair is our crowning glory, so we need to take care of it every day. Combing is important, so you must invest in a good piece that will treat your hair right. If your hair tends to pull, fall and break as you comb, probably it’s time to replace it with a better one. Wooden combs work better in rescuing natural hair as compared to plastic combs, and one of the best materials out there is sandalwood. Has anti-itch and anti-inflammatory properties due to the natural essential oil. Sandalwood combs are widely available, and you can order them from Amazon. This Wide Tooth Hair Comb from Breezelike is made of natural green sandalwood crafted with Chinese traditional handicrafts. This one’s from a type of wide-toothed comb that doesn’t have a handle. The tip of the comb’s teeth are rounded to be gentle to the scalp and the rounded teeth are spread 4 mm apart for easy detangling of curly and thick hair, as well as wet hair. This comb is rich in natural sandalwood essential oil that spreads from your scalp to hair tips, making it easier to glide down your hair. You can see some unique distinctive wood grain in it. If you’re looking for something with a handle, this Wide Tooth Detangling Comb from PureGLO is a great choice. With this simple yet beautiful wide-toothed comb, you can easily detangle any type of hair. It’s made of 100% organic green sandalwood with a soothing natural aroma. The color of the wood can darken over time. As you glide through your scalp, you can feel it massaging your skin rather than scratching it. This wide-toothed comb works well for those with scalp inflammation and pimples. Because it’s of premium quality, it can be given as a gift, as it comes with a gift box and a nice drawstring bag. You can also buy a set of comb, with one wide tooth and one fine tooth comb. Onedor Natural Handmade Green Sandalwood Wide Tooth & Fine Tooth Hair Combs Set is made from high-quality green sandalwood with pattern variations by artisan craftsmen. 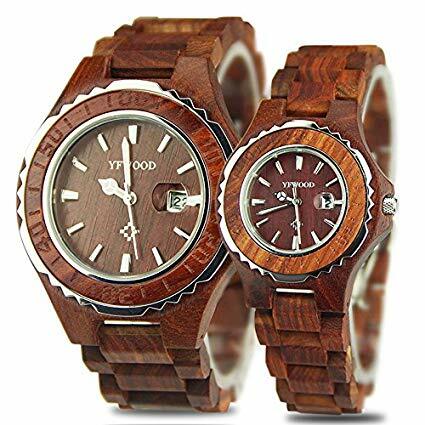 This is a pair of beautifully crafted woodwork that you will surely be satisfied with. It feels very solid, and you’d be provided with both comb types for your different combing needs. For bearded men out there, there are also a lot of sandalwood combs for you. This Natural Sandalwood Beard Comb from Rocky Mountain Barber Company is one good example. It’s a durable and portable two-sided comb perfect for maintaining beards and mustaches. One side of the comb has fine tooth while the other has a medium tooth for ultimate beard control. It’s made of premium sandalwood, so it has the signature sandalwood scent. Regular combing of the beard removes dead skin cells, thus improving the appearance of your beard, promotes healthier growth, and avoids dryness, flaking, and brittleness. It comes with a quality leather carrying case and a box. If you’re looking for a sandalwood comb set that can be easily gifted, get Cypress Lane Sandalwood Hair Comb and Beard Comb Set. It comes in a set of two combs: one hair comb and beard comb, both with medium tooth. It comes in an elegant gift box, so it’s very presentable. Both combs are small in size, making them portable for on-the-go grooming. It comes with a rich, natural sandalwood aroma that is sure to please. The Xuanli 2 pcs Natural Sandalwood Comb is another beautiful gift set, preferably for a woman. It comes in a set of two combs, one fine tooth, and medium tooth comb. The first thing you’ll notice about the combs is the gorgeous, intricate detailing that features carvings of butterflies and plants. It looks like a comb of the royals! When you pick it up, you can easily smell the aroma of sandalwood fragrance. It’s gentle on the scalp and hair and doesn’t snag or catch. It would make a perfect gift for your long-haired girlfriend, mother, wife or a friend. If you need a comb for hair styling, use Breezelike Sandalwood Fine Tooth Comb. Its round wooden fine tooth helps to massage the scalp and distribute oils, especially when using conditioners and detanglers, it helps smoothen out hair when styling. The rat tail handle works great for teasing and sectioning hair. This comb is made of pure green sandalwood, complete with its natural aroma and fragrance. In order to preserve your sandalwood combs and keep it shiny for longer, use natural oils like olive, jojoba or camellia oil to clean them instead of using water. Avoid dropping sandalwood combs on hard floors or collide them with other hard objects. When you need to wash them, wipe them dry using a cotton towel afterward. Also, avoid putting it in high-temperature or strongly lit places.